• Scale accuracy at 0.5% of system capacity. • Scale parts are stainless steel for wash-down. 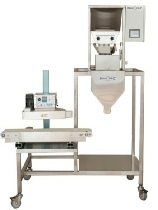 • Sealer and conveyor are designed stand-up pouches. • Will seal: polyethylene, polypropylene, laminates, nylon, PET/ polyester.